I continue to be distracted from my First World War blogging endeavours. One day I will return to them, but in the mean time here is a list of things that happened since my last post. I am particularly sorry to have missed the anniversary of the Irish parliament’s first meeting, but it could not be helped. 8/1/1919 Expanding into territory abandoned by the Germans, the Red Army reoccupies Vilnius, which is separately disputed between Poland and Lithuania. 09/1/1919 Fearful of the Red Army, the Latvian government begins to recruit a mercenary force from demobilised German soldiers. 10/1/1919 Fahreddin Pasha surrenders Medina to the Arab followers of King Hussein of Mecca, more than two months after the Turkish armistice. The two and a half year siege is now over. 11/1/1919 Ebert‘s government sends the army and the Freikorps militia into Berlin against the uprising by the far left Spartacists. 11/1/1919 Russia’s Bolshevik government begins draconian grain seizures from peasants in the territories it controls. 12/1/1919 Elections in Bavaria see Kurt Eisner‘s socialist government routed. 12/1/1919 The peace conference in Paris begins with a meeting of Wilson, Lloyd George, Clemenceau and Orlando, together with their foreign ministers. 13/1/1919 Despite their country’s almost non-existent contribution to the Allied war effort, the Japanese delegation to the Paris Conference joins the American, British, French and Italian delegates on the conference’s supreme council. 13/1/1919 Amidst great bloodshed, the Germany army and the Freikorps crush the Spartacist uprising in Berlin. 15/1/1919 Karl Liebknecht and Rosa Luxemburg, leaders of the failed Spartacist uprising, are captured, tortured and murdered. Luxemburg’s body is dumped in a canal. 15/01/1919 21 people suffer a squamous death when Boston’s North End is flooded by molasses. 16/1/1919 Influenza claims a high profile victim, as President Alves of Brazil succumbs to the epidemic. 18/1/1919 The Paris Conference holds its first plenary session, on the anniversary of the 1871 proclamation of the German Empire in Versailles. 19/1/1919 Germans vote in elections to a constituent assembly, with women voting for the first time. The Social Democrats and the Centre Party win a majority for their brand of moderately reformist republicanism. 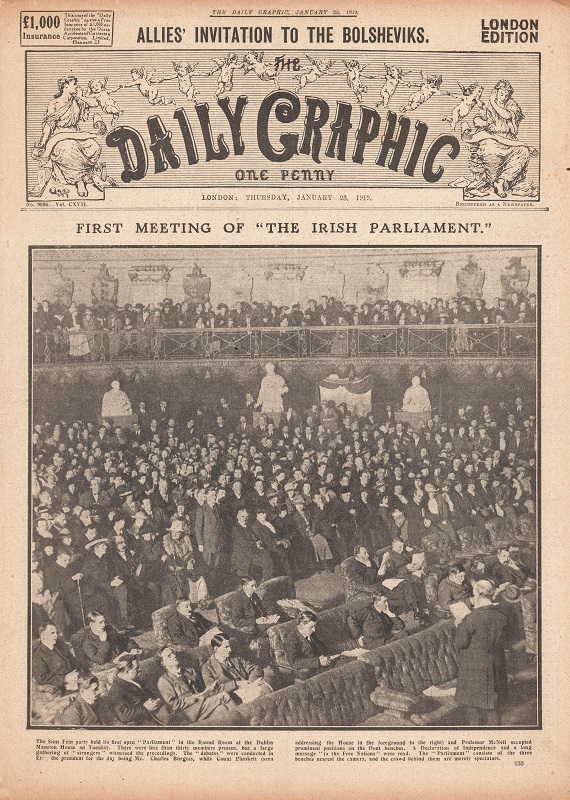 21/1/1919 Sinn Féin MPs elected to the British House of Commons assemble in Dublin and declare themselves to be Dáil Éireann, the national parliament of an independent Ireland. On the same day members of the Irish Volunteers coincidentally kill two policemen in an ambush in Soloheadbeg in County Tipperary. 23/1/1919 A border dispute between newly independent Czechoslovakia and Poland turns violent as Czechoslovak troops attack Polish forces in Silesia. 24/1/1919 At the Paris Conference, South Africa, New Zealand and Australia present their claims to German overseas territories they have occupied since early in the war. 26/1/1919 Independent Poland holds its first general election. The new parliament will draw up a constitution for the nation.